It is time for sunset cocktails at Mina Seyahi's waterfront Marine Boat Club in downtown Dubai. Glasses clink amidst the din of lazy drawls and banter. Business barons and aristocrats, their jaw-droppingly beautiful partners in tow, enjoy the good life. The world's rich and famous have gathered, quite literally, under one roof. At the opening gala of the 20th Dubai International Boat Show (DIBS) inside the VIP lounge of Officine Panerai, the mood is upbeat. While they swirl champagne and quaff hors d'oeuvres, their attention turns to the four wooden pillars with glass cases on top. Held within each of these is a testament to the legacy of exceptional Italian craftsmanship. These timepieces by Panerai, two Radiomirs and two Luminors (see box), mirror the marquee's heritage in nautical horology. Given the drama, glamour, history and hype linked with this starry event, Panerai's association with the boat show seems a natural and calculated fit. The 20th Dubai International Boats Show that held in March was one of the largest exhibits of luxury boats and yachts in the region. A brand that threw it's doors open to the luxury market only recently, Panerai has found a following among an elite group of people who understand and appreciate the fine art of watchmaking. The subtle use of the marine metaphor coupled with a 'maximalist' watch design-think, the big dials and distinguishable case and strap-is what makes these watches instantly gratifying and worthy of being labeled a collector's item. The story of Panerai's maritime pedigree began in 1860s Italy, shortly after the many states of the Italian peninsula unified into a single nation. Nationalist Massimo D'Azeglio is said to have remarked, "We have made Italy, now we have to make Italians." Somewhere in the city of Florence, family man and horologist Giovanni Panerai was listening intently. While the Swiss were and have been leaders in high-end watchmaking , the path that Giovanni and his successors took etched the nationalist ethos deep into the brand that Panerai was to become. By the early 1900s, Panerai became the sole supplier of diving equipment and timepieces to a proud Royal Italian Navy. The brand's wartime production saw the rise of its biggest milestone till then, the Radiomir-a radium-based powder that turned dials luminous. By the time of World War II, Italy engaged in serious military expansion, forcing Panerai to meet the navy's burgeoning demands. This lead to the production of a prototype of the Radiomir that was created for the underwater exploits of Italy's first submarine corps. The timepiece's features became the brand's most distinguished leitmotif: a large steel, cushion-shaped case (47mm), luminous numerals and markers, wire loop strap attachments welded to the case, and a water-resistant strap that was long enough to be fastened over a diving suit. Radiomir became the first watch to have survived depths of up to 200 metres. By now Panerai was married to the naval legacy and Mussolini's surrender in 1943 hit the company hard. Over the next decade, they turned their attention southwards and developed models like The Egyptian. This underwater Radiomir watch boasted exceptional size and solidity, and came fitted with a marked bezel for calculating immersion times. 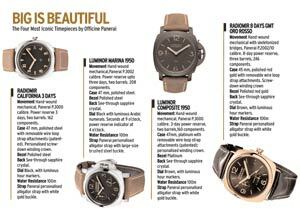 For the next 40 years, Panerai continued as the nondescript supplier of military hardware. In 1993, some 133 years after opening its doors in Florence, the company launched its first commercial collection, comprising three limited edition models. These watches, inspired by the ones created for Italy's World War II navy commandos, brought Panerai into the hallowed circle of luxury watches. No longer an Italian navy supplier the brand was purchased by the Swiss-based Richemont luxury group (then VendÃ´me) in 1997. Soon, celebrities like Sylvester Stallone grew attached to the Officine Panerai brand. In 2002, Panerai developed its first self-made movement. To mark the occasion, it named the movement P.2002. After nine years of continuous innovation, Panerai's current selfproduced movement has developed to the P.3000. This manual winding movement has a thickness of 5.3 mm and a diameter of 16 fractations. It also has 21 jewels and two adjacent barrels which are endowed with a 3-day power reserve to release longer and balanced power to the timepiece. Today, the brand has successfully tapped into emerging markets like India and Officine Panerai has distribution dealership with Johnsons Watch and Co. and The Helvetica here. It is also launching an exclusive Panerai boutique in Mumbai. It has been a long journey from being a watch for the navy, to one that embraces the nuances of luxury, but Officine Panerai has managed the transition with elan. Despite this marked change in brand perception, even today it remains true to its DNA, which explains its association with the Panerai Classic Yachts Challenge regatta and the DIBS. It was after all born for the high seas.